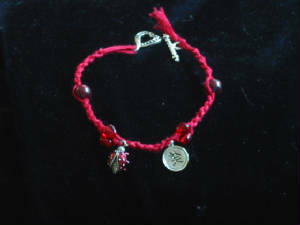 Twelve strands of red DMC embroidery floss anchor a pewter ladybug charm, a Chinese symbol for "happiness" and a variety of red beads. 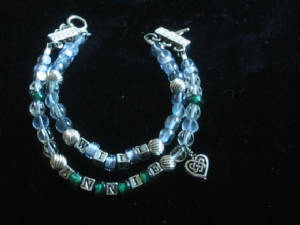 Sterling silver 4mm letter beads in your child's name are surrounded by a variety of sterling silver and glass or crystal beads in the color of your child's birthstone. Toggle closure. 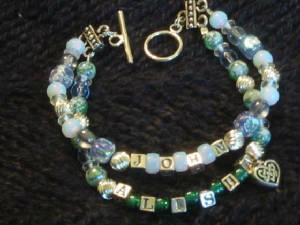 $25 per strand for models shown above; ask about pricing for custom models.